After visiting with the DFW Cocker Rescue folks at a meet and greet in late April, I went through the very thorough adoption application process. Although my first heartthrob was adopted in the meantime, I went to the special needs/senior dog meet and greet and met Bayou. Now this little guy is a “senior” at 9 years or so, and has cataracts. But his little tail doesn’t stop wagging and I don’t think he’s ever met anyone he didn’t like! I prepared my home for him, and worked out an exchange point and time with his foster mom. I’m fostering him for the moment. But I’ve lost my heart. He looks like a little old grizzled man with bushy eyebrows and a bit of a bushy mustache, bushy hair on top. Here’s his official photo. We got off to a rocky start, as Bayou and Little Bit (the “tiny” cat) became acquainted, and Bayou learned of his place within the pack. Following are a couple of progress reports I sent his previous foster mom. 6/13/12 The cat and Bayou just stared at each other in the kitchen last evening. Bayou didn’t know what to do with this strange type of dog, and the cat was cautious. Later, as I read in the living room, Bayou was asleep on the couch, the cat sprawled on the coffee table, and the lab in the middle of the floor. Then the cat decided to go over to the side table (on Bayou’s end of the couch), Bayou was startled and jumped, cat freaked, there was a blur, with cat launching off my arm (I have wounds to prove it! ), and Bayou on his back yelping. No damage, just scared. He went over to my chair, crying and the lab and I went over and comforted him. The cat has maintained a ghostly appearance, and Bayou seems to be ignoring him. (The cat is about Bayou’s size and is willing to live and let live.) Wasn’t that exciting?! 🙂 So then we went up to bed, and I moved the beagle’s little bed over close to my side of the bed. Ha! When I climbed in, Bayou presented himself with paws on the bed and looked at me. I lifted him up, he cuddled and then went to the foot of the bed and curled up. We did have a middle of the night visit to the backyard, which Bayou announced by not climbing into bed with me again when I got up for my bathroom break. He’s a bit anxious about going out without my standing watching. That’s okay, because it’s strange. He is glue to me now, but learned that the lab also has access to me, when he tried to be non-sharing last night. He just needed some reminders about behaviors in the pack. Meanwhile, he appears to like our filtered water! 🙂 My son loves him. He reminds me of a grizzled old man from the mountains, with big bushy brows, tousled hair and maybe a bit of a beard. He’s so cute! He made a trip to the vet (ophthalmologist) yesterday and is deemed a candidate for cataract surgery! He just might be able to see well again! 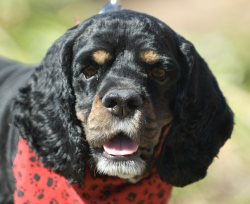 But the cocker rescue group needs to raise funds to cover the surgery. Anyone so inclined can go to Their website at www.dfwcockerrescue.org and make a donation in his name. Posted in dfw cocker rescue, dog rescue, foster dog.